Here’s a round-up of all my favourite looks from the shows in Paris last week. I’m breaking it up into two parts because there are quite a few. Let me know what you thought about the collections shown in Paris and Milan over the last few weeks. I loved Acne’s Fall runway show for many reasons. First of all I loved how Jonny Johanssen subtly incorporated faux leather and fur amongst more luxurious fabrics. The colour pallette was full of deep tones like rust red, moss green as well as pastels, which really added a light touch to the collection . I really loved the way the looks were layered, especially the cropped shearling lined leatherette (yeah you heard right, fake leather!) jacket and the quilted jacket worn over yet another quilted jacket. I love the way they played around with length as well. Altogether I’d say it was one of the collections that really captured the modern day man’s wardrobe in a successful and playful manner. Dries Van Noten was another great collection. There was a great deal of emphasis on the suit (a common theme with most of the Fall 2012 collections), it was a great mix of quite sharp tailoring as well as a loose, more relaxed fit. I really loved the ultra thin belts that complemented the slightly exaggerated waist lines. 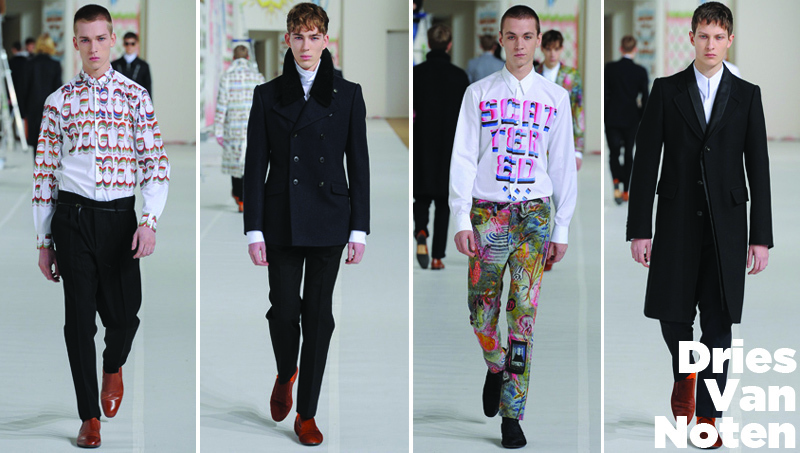 One of my favourite features was the psychedelic, 60’s inspired prints seen in the shirts, suits and jackets, trust me when I say that the graphic design student in me squealed in delight after seeing the quirky typography used in some of the prints. 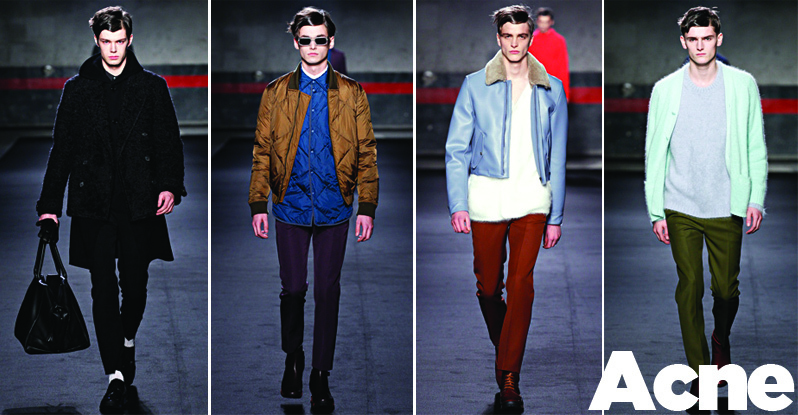 The outerwear was so well executed, I really loved the double-layered lapels and the slightly cinched in waist. It really felt like a nostalgic collection and I’m sure it’ll feature prominently in upcoming editorials. 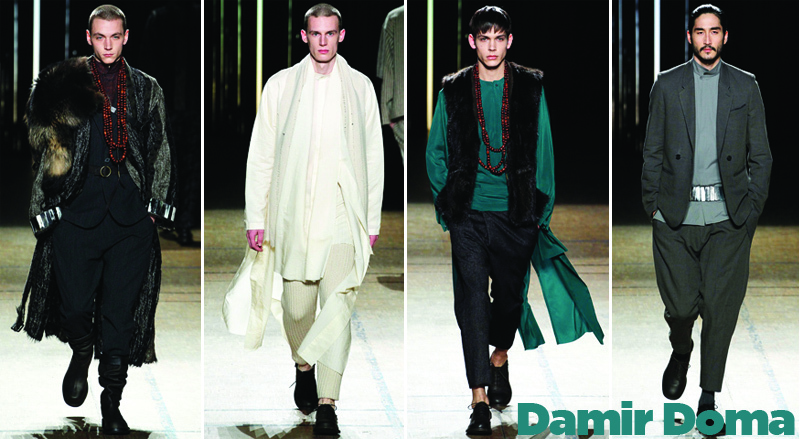 Damir Doma’s autumn collection felt a lot like a journey around the world. Doma seemed to take us through the wardrobe a nomad with Asian, African and Slavic references. I loved the oversized sleevless fur jackets and the beaded necklaces. I thought that the relaxed and loose silhouette was a great choice, it gave the pieces a real sense of movement and freedom, the colour palette complimented this extremely well. I think the theme and concept of the collection was executed well, I love the way that Doma was able to balance luxury textures and colours with a sense of minimalism. The key influences for Riccardo Tisci’s latest collection were the mythological Minotaur and the American Flag. Tisci’s models charged down the runway each with his own glistening nose ring. 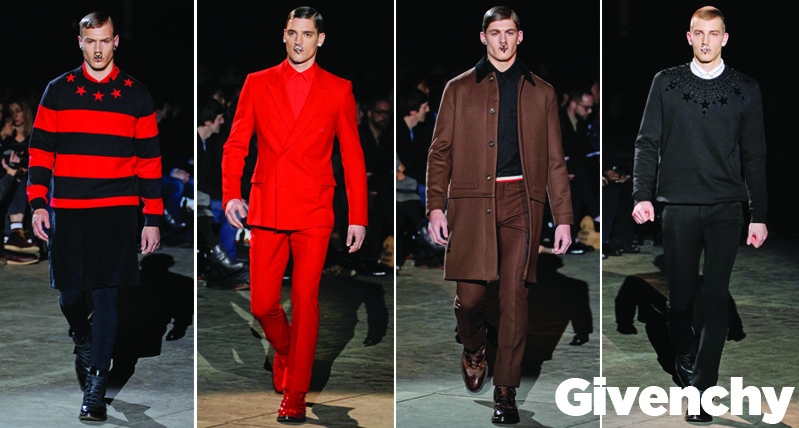 The collection was made up impeccably tailored suits and kilts which have become a staple at Givenchy menswear shows. I really loved the colour palette, it felt strong and confident. Tisci mostly stuck with a brilliant blood red and black, there were hints of dark blue, brown and white towards the end of the show. Tisci used the stars and stripes as motifs throughout the shows mostly on the sweaters and jackets. 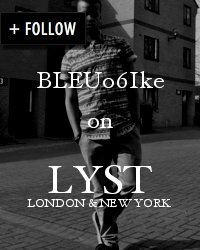 The footwear was definitely on point, especially the red, beaded brogues which I’m currently lusting for!